to Carly, the winner of the Weddingbee Naugi giveaway! 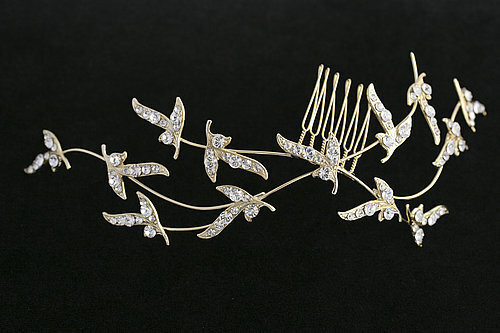 Carly selected the Aries Headpiece to wear for her June 2009 wedding. We can’t wait to see photos, Carly! Yippee! I’m so grateful for this giveaway and I’m so excited to see my completed piece in person!! Thank you, Jessica! I received my piece in the mail last week and I am completely in love. It is even more beautiful than the picture on the website. It’s amazing! I can’t wait to wear it and keep it forever. Thank you, Carly! I am so thrilled to hear you love the piece. What a great ending to the Weddingbee / Naugi giveaway. Well not exactly the end…I hope you’ll email us a photo after your wedding next summer! Oh, & congratulations on being selected as the newest Bee bloger, Miss Glitter! I think these pieces are beautiful. I have mailed you on the customer services website on your homepage.